A beachcomber shuffles along the sand, shifts his metal detector slowly left, then right, in search of something shiny or black. He scores a few bottle caps, loose change … and, then, he spots pieces of eight (gold), and silver that has a black silver sulfide patina on its surface. It’s the stuff that dreams are made of. * Treasure hunters today hope to strike it rich like Kip Wagner did in the 1950s. Wagner, a retired Florida contractor, frequently went to the beach in search of driftwood next to the Sebastian River. Instead, after a hurricane, he found a piece of eight – also known as a cob, a Spanish silver coin dating back to the 1700s. He wondered why gold and silver kept washing ashore near his home. None of the coins were dated past 1715. He began working with his friend, Dr. Kip Kelso, in researching shipwrecks from that time. They discovered that the treasure came from the 1715 Spanish Treasure Fleet. During a violent hurricane, 11 of 12 Spanish Galleons and one French ship sank between Sebastian and Fort Pierce. About 700 people – crew and passengers – lost their lives, and the fleet’s precious cargo of gold, silver, jewels and jewelry now lay on the ocean floor. Some 1,500 survivors struggled to shore and set up camp while awaiting rescue. This site, now known as the Survivors’ and Salvagers’ Camp, is in the Sebastian Inlet. Help did arrive within weeks. “Over the next four years, official Spanish salvors, Indian divers, English pirates, and privateers and river pirates of various nationalities flocked to the area to retrieve – or steal from each other – as much treasure as they could,” according to the McLarty Treasure Museum in Sebastian, Florida. Wagner purchased a $15 Army surplus metal detector. That led to finding the encampment, cannonballs, swords and artifacts from that site. Later, he took his search to the ocean and discovered remnants of one of the ships. With the aid of their subcontractor, Mel Fisher, Wagner’s group – the Real Eight Company – salvaged the wreck of El Capitana from the 1715 Fleet. There are still untapped treasures and areas to explore along the Treasure Coast. Who knows what the next major storm will stir up from the ocean? Have you ever searched for treasure? Gold? Books? Memorabilia? What was your best find? 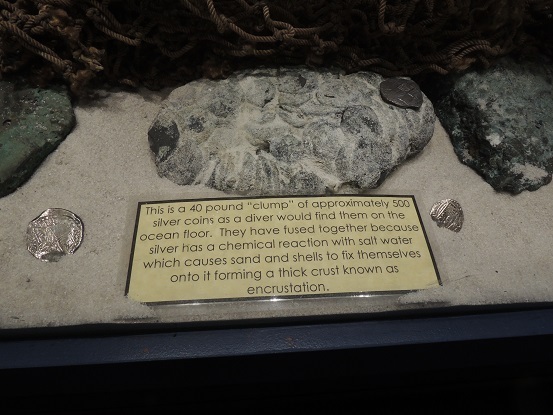 3.Photo: Mel Fisher’s Treasures – 40 pound “clump” of about 500 silver coins as a diver would find them on the ocean floor. What are the odds, Judy? Two guys named Kip become friends? Great Saturday morning share, my friend. Today, I just discovered that a fellow teacher and Facebook friend’s granddad was part of the Real Eight team who searched with Kip Wagner and his belongings are part of the museum’s display. I’m glad you enjoyed the story. Just the adventure of it all is so exciting, the prospect of finding silver doubloons, especially! Judy, it is so cool since I published my post and in the midst of it, there is an “X” marks the spot (and treasure maps) reference! I pushed this at 9:56 am on Saturday and you published this today! Wow! Great minds are on a similar vein, not necessarily thinking the same thought, though… my post is about ‘spots!’ ha ha! If only I had a treasure map, Robin, where “X” really did mark the spot of untold treasures. Then, again, that might be a real headache. Great minds do think alike. A teacher friend of mine told me, after reading my story, that her granddad was part of the Real Eight Company who salvaged the 1715 Spanish Fleet wreck. How exciting it must be to find something from so long ago. Was interesting to read about this. Thank you. Oh, I went back and read your Dad’s desert adventure with the Mojave mine where there was a hole in a wall of mountain. Cool and exciting tale, too! Smiles! My Dad and your Dad would have challenged each other with two different adventurous souls. My Dad was a member of the Ancient Astronauts Society who had amazing members, I have signed books by them but wish he could have taken a photograph of them all together. Erich Von Daniken, Carl Sagan and others there all thought there were aliens here on earth. My Dad paid a pilot to fly above the Nazcan desert where the iron filings look like dragonflies and different weird things, he then drew these flying vehicles with their landing gear to look like the shapes he found on the desert. Interesting, but he got quite a lot of weird looks when he would start in on these subjects! He made three self-published books along with his Hot Lab book. This was semi-autobiographical and then, futuristic in the second half. Your Dad would have taught him about nature and the excitement of discovery of minds and caves. Also, those stories of betrayals of finding gold would have interested him, too. They may have vied for each other’s attention, sometimes interrupting or expanding their thoughts. Nice to chat with you, Judy. Thanks for this post and comments, which made me wish we still had them around… I would listen much more intently, Judy! Robin … Give this story of mine a read to learn a bit more about my Dad’s background: https://earth-rider.com/2013/02/02/the-dark-side-of-the-moon-landing/ Dad was an electronics engineer who worked on the space program in Huntsville, Alabama and on the rocket program in Nevada. I’m sure he and your Dad would have had a lot to talk about. Love this bit of history Judy! It was my dream as a child, to find a treasure map and then find the treasure. Not so much for the treasure itself, but for the adventure in tracking the treasure. People ask me how I come up with ideas for blog posts. I wonder the same about you – always so fresh with topics unpredictable. I had no idea that N. C. Wyeth illustrated any edition of Robert Lewis Stevenson’s books – striking! Where have I found treasure? Two items come to mind: On my writing desk is a paperweight with pieces of fool’s gold we unearthed on one of our trips to North Carolina, I believe. Other treasures? Antique books, most given to me by friends, my favorite being Letters of John Keats to Fanny Brawne, 1901. Last month we discovered a family Bible in German with a 1765 copyright date. Who knows what we will find next! Thank you, Marian. Sometimes I feel that I am scrambling for ideas. This one stems from the visits we made last month to treasure museums in Sebastian with our grandchildren. Fascinating stuff. 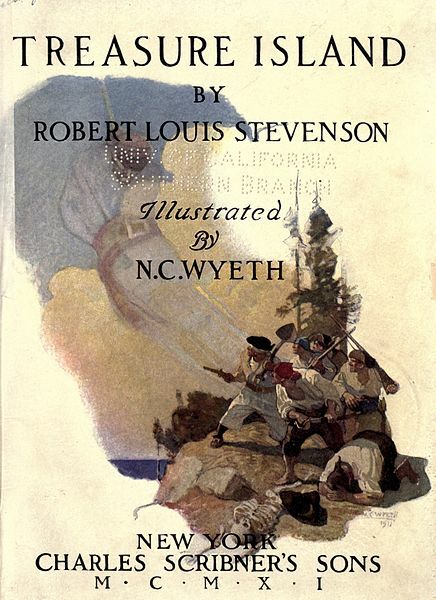 Until I was searching for photos of Treasure Island, I was unaware that N.C. Wyeth illustrated Robert Louis Stevenson’s book. Somehow those kinds of adventures never happen to me. Thanks, Rick. I was surprised when a fellow teacher told me, after reading my story, that her Granddad was one of the original Real Eight. Some of his belongings are in the McLarty Treasure Museum that my husband and two grandchildren visited with me last month. I’ve never found anything anybody else would consider treasure, that’s for sure. Isn’t there just so much romance attached to these tales? The very idea of sunken treasure just captures the imagination like almost nothing else. That photo of the giant blob of fused together silver coins is quite something! Very interesting post, Judy, thank you. Melisa and me find pennies, and occasionally dimes. We’ve never found or won anything of consequence . . . I think we used up our “finding treasure” quota when we found each other. A $15 Army surplus metal detector? Wow. Thanks for sharing this amazing adventure. I once found a big horse-shoe-shaped magnet on my grandfather’s work table in his garage. We went to the grassy hill where picnics had covered the lawn during a 4th of July celebration. I scoured a big portion on my hands and knees, and the magnet (and good eyesight) netted me several nickels, a penknife, a belt buckle and a handful of nails. 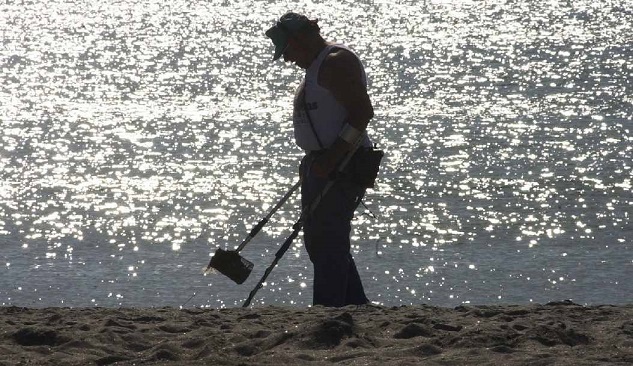 That was in the 50s that he bought a metal detector for $15. I wonder what that would go for today. That had to be fun, Sue. I was a tomboy. So I often was off looking for an adventure … and a treasure! I was a girly girl… but did had all the tomboy adventures. It was great fun. Judy I often joke to my daughter that we might find treasure on the beach when we are looking for shells. Now that would be something to tell the grandchildren. Love the slice of Treasure Island such a melody with words. Thanks for an entertaining read as always. When I was about 5, I dug for treasure in my sandbox. In those days, a sandbox was an bottomless box into which my dad dumped a pile of sand. Dug through the sand and into the earth with my little shovel. Dug and dug and dug, until I found a reddish rock. I was convinced I’d found hell (yes, I always did have a very storied imagination), and I ran into the house to hide under my bed so the devil wouldn’t find me. I never did work up the courage, after that, to search for any more treasures…. And I thought I had an overactive imagination. No wonder you gave up rock hunting at such an early age. How I miss the beaches of Florida where I grew up! Your story reignites all my childhood fantasies of discovering something valuable in the sand. A good read and definitely carries shades of Stevenson’s Treasure Island, from which you have quoted. Somewhere deep down, each one of us believes that we will hit a jackpot. “Hope springs eternal in the human breast”. Clearly manifested in the huge interest in Casinos, lotteries and lucky draws. But can the probability of our winning be improved in some way? That is a question I would be keen to get an answer too…. Thank you for the compliment. I just got thru re-reading Robert Louis Stevenson’s “Treasure Island.” It was published in 1881 and is still an exciting read. I recently watched an episode of Shark Tank where a treasure hunter was pitching his treasure hunting business. The sharks didn’t bite, but if they’d read this post first, they might have! The only “treasure” I ever found when I was a kid was two pipes hidden in knotholes in an apple tree I shouldn’t have been climbing. In retrospect: clearly hidden by teenagers who were doing a little puffin’ without their parents’ knowledge. O young and innocent days!! I enjoyed the Hardy Boys, too. But having recently re-read “Treasure Island,” I have to say that book really holds up. It’s an exciting adventure filled with greed, betrayal, risk-taking and surprises. Great fun! I think YOU are a find, Judy.